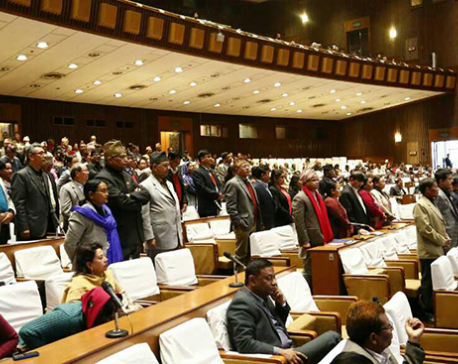 KATHMANDU, April 11:The new constitution amendment bill registered at the Parliament Secretariat by the government on Tuesday has drawn a mixed reaction from the agitating Madhes-based political parties. While a section of the Madhes-based parties said that the bill, if endorsed by the parliament, will create an environment for them to participate in the election, other parties are not impressed by the latest government overture. Chairman of the Federal Socialist Forum-Nepal Upendra Yadav termed the government move a positive development. “If the amendment bill has been introduced as per my suggestions, it is good. But as I have not yet seen a copy of the amendment bill, I am not in a position to comment on it,” said Yadav, who is currently outside the Kathmandu Valley. Sources said Prime Minister Pushpa Kamal Dahal had repeatedly held meetings with Yadav and other leaders of the agitating Madhes-based parties before finalizing the draft of the amendment bill. The prime minister in consultation with other ruling parties had taken initiatives to introduce the new amendment bill as the previous seven-point amendment bill could not be endorsed through parliament mainly due to non-cooperation from the opposition alliance led by the CPN-UML. However, vice chairman of Tarai Madhes Democratic Party (TMDP), Hridayesh Tripathi said the new amendment bill has further complicated the situation. “This is nothing but a conspiracy to annul the previous seven-point constitution amendment bill. This could be a strategy to settle the intra-party rift that exists between the ruling Nepali Congress (NC) and CPN (Maoist Center),” said Tripathi. Expressing doubt over the endorsement of the amendment bill by parliament as the opposition alliance remains opposed to it, Tripathi said they could think of participating in the election if it is endorsed. “The main opposition party has already made it clear that they won't back this bill, either. Although the bill does not address all our demands, we can think of participating in the election if it is endorsed by the House,” he further said. Meanwhile, CPN-UML Secretary and chief of the party's Publicity Department Yogesh Bhattarai has said that his party does not support any demands that go against the spirit of federalism. “Although they always keep harping on their contribution to introduce federalism in the country, the Madhes-based parties are not committed to federalism in true sense of the word. The UML will never support any demand that is against federalism,” said Bhattarai. Bhattarai argued that the demand put forth by the Madhesi parties to disenfranchise chiefs and deputy chiefs of rural municipalities and municipalities from casting votes in the election of the members of national assembly, for instance, is totally against the spirit of federalism. “This is an attempt to weaken the local bodies. We won't accept this,” he further said. Earlier on Monday, a UML Standing Committee meeting had decided not to change their position on the constitution amendment proposal, while reiterating their old stance on the demands put forth by the agitating Madhes-based parties. The UML has maintained that the demands put forth by the Madhes-based parties are 'anti-national' and has vowed to foil it in parliament.